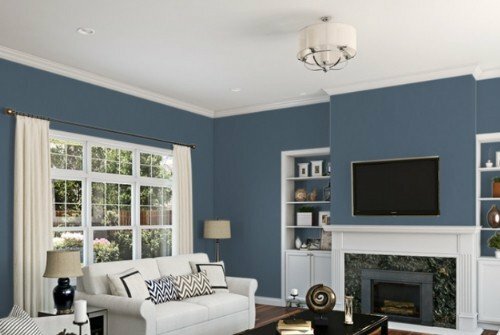 Are you looking for some fantastic paint colors that are both on trend and long lasting? Well you’ve come to right place. 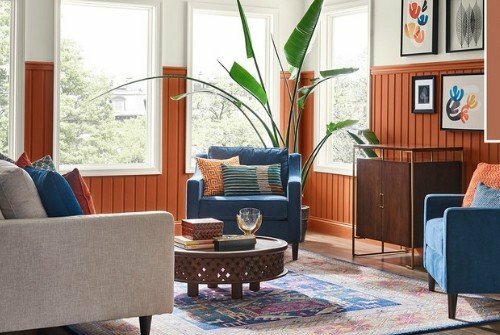 Sherwin Williams and Pottery Barn have selected their iconic colors of year. Iconic means that they are dramatic and make a statement, as well as timeless, so they will work for years to come. Within these paint selections, I review my top 5 picks that make an impact and are to decorate with. Also, at the end, I include a link to a coupon at Pottery Barn for Sherwin William’s paint. 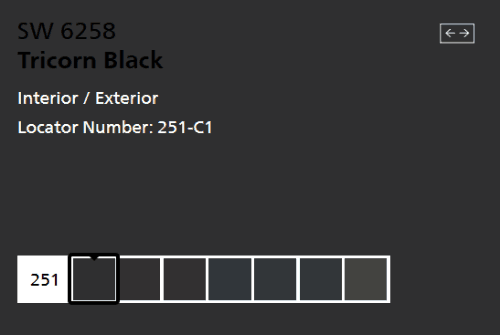 Tricorn Black is softer and grayer than a typical black. It’s dramatic and unexpected and allows you to contrast other items in the room – whether it’s furniture or area rugs. It’s a neutral color and goes with almost anything (in the same way that black pants just work no matter what you’re wearing on top). It goes especially well with blues, taupes and silver, and contrasts well with wood and leather surfaces. Tricorn Black an especialy for for a formal room, a media room, a bedroom (really helps with a good night of sleep) or a man cave. 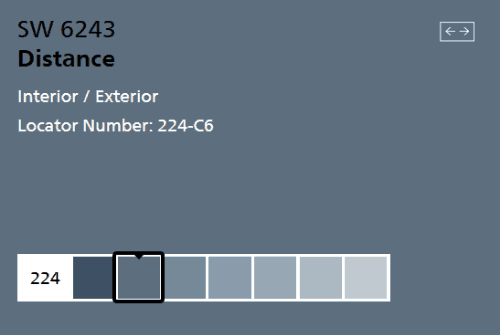 This is Sherwin Williams’ Color of the year. It’s a terra cotta look, and it’s perfect if you’re looking for warm earth tone or a southwest look. Check out the video below to see the depth and beauty of this color. It contrasts really well with both black and white trim. It also works well with other natural and neutral colors and surfaces such as sisal and jute. Check out Sherwin William’s Cavern Clay in this video. There are some great decorating ideas. And, you’ll hear about a wonderful discount offer that Pottern Barn has for you. Now, I will be honest, this is not my favorite color. It’s an interesting idea, but in my opinion, it can be a bit much if you paint the whole room in this color. I personally think it looks better as an accent wall or a partial wall. Rewatch the video and check out how it really works when they integrate a lot of white in the design and then Cavern Clay is used more for a pop of color. Tie it in with an area rug, blanket or 1 or 2 other accent colors and you are all set. 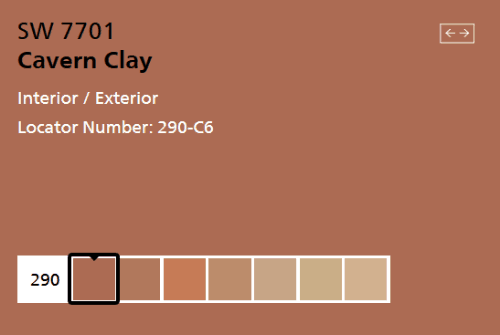 Many describe Cavern Clay as a dusty baked clay. 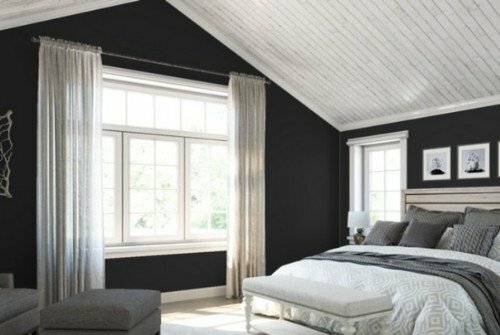 This versatile color pairs well with most wood, especially dark, ebonized wood, distressed grays, and rustic woods. And, if you get tired of the color in a few years, just repaint your accent wall with a new shade, but a few pillows and voila, you have a whole new room on a budget. I just love this dusty denim blue. It works for casual, coastal, rustic as well as modern decor. It just fuses everything together. This color works great as an accent wall or a stand alone color. Check out my article on the best blue grays if you’re looking for other options. 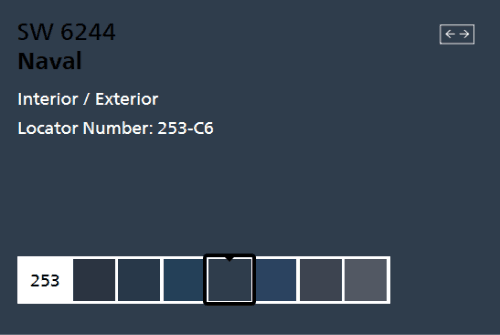 I feature a range of lighter and darker dusty blues as well as gray blues. 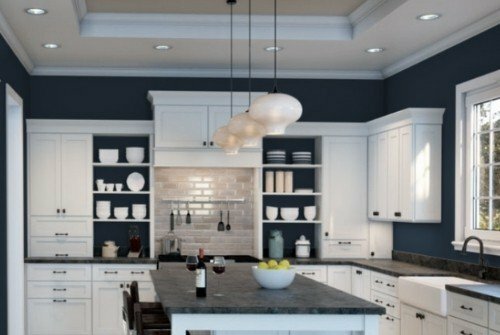 While navy is a color, nowadays, it’s really seen as a neutral color, and it can work in many rooms in the home. It’s perfect for bedrooms (and help you fall asleep faster). It also works well as an accent wall – whether it’s a bedroom or a living room wall. It pairs well with white trim and also Sherwin Williams Gray Screen. It can even work in a kitchen, especially if you have white cabinets and open shelving. 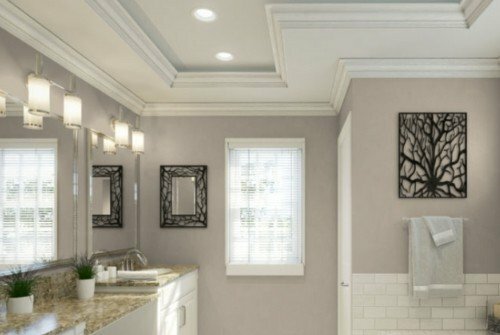 Naval is such a wonderful contras vs white and looks especially high class when you have crown molding of coiffured ceilings. I am loving Shiitake as it’s beige that doesn’t look boring (yes, I hate the basic builder beige or boring beige). This color has some real life and depth to it as it has come grays and taupes blended for a more sophisticated look. So if gray isn’t your thing, and if warm grays or greiges are still too gray and cold for you, give Shiitake a shot. It’s an oyster mushroomed colored neutral. Over time, the grays are warming up (see 9 amazing warm grays and greiges). This take the warmth up a notch. 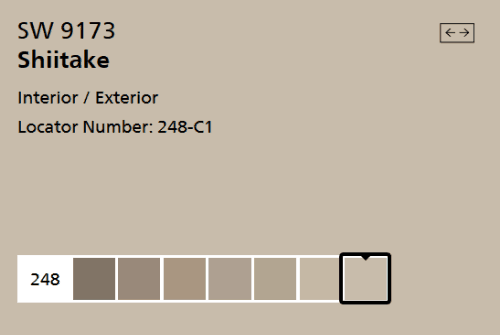 It’s not a beige as Accessible beige, so it’s an even more up to date color. It’s a warm neutral that goes with almost everything. Shitake is one of those rare beiges that goes with almost every color of hardwood floor , rardless of whether it’s light, dark, mid or reddish. The taupe and pale green undertones just allow it to blend into any environment. One of the other things I love about Shiitake is that it works with a lot of tiles, especially natural stone or porcelain look alikes. 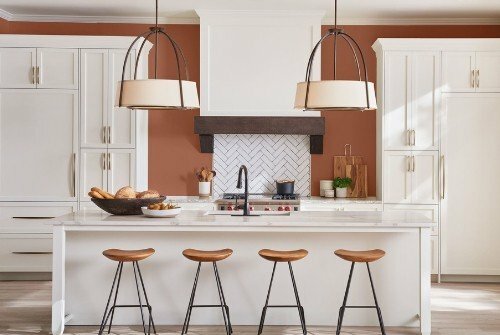 I sometimes find it challenging to find a good paint shade for kitchens and bathrooms that have natural stone floors, walls or backsplashes as most of those tumbled and rustic tones are warm or warm colors blended in. Shiitake can work with most of those tricky colors. 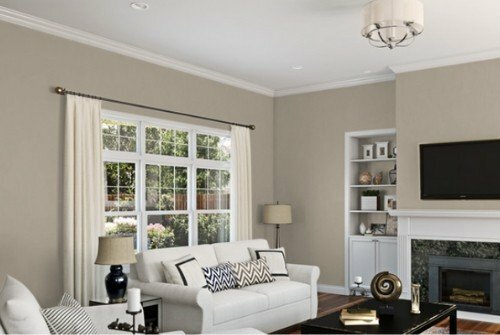 If you’re planning to DIY your paint job, check out this quick video from Sherwin Williams and Pottery Barn. They share useful tips on the best tools to use to make your job come out better and help you do the job faster. Oh, and here’s where you can find the Pottery Barn discount on Sherwin Williams paint. If you’re looking for a dramatic or iconic paint color for one of your rooms (or just an accent wall), one of these 5 may be the perfect selection for your room. In the comments below, let me know your favorite. Personally, I love Naval and Distance. More and more of my painting customers are asking for Navy these days. But, what do you think?